I have gotten pretty used to non-traditional Thanksgiving dinners. Since 2005, I have made it to Philadelphia for Thanksgiving with my family precisely once, and four of those years away have been in China, where turkey and stuffing can be hard to come by. Like The Atlantic’s Matt Schiavenza, I have turned to a Chinese KFC to supply my Thanksgiving dinner (in 2006), though I don’t like KFC enough to ever do that again. Lukewarm chicken and instant mashed potatoes are just sad reminders that people at home are eating much better meals than you are. Due to Shanghai’s expat population, there are plenty of Western restaurants in the city that offer heaping Thanksgiving buffets groaning beneath platters of turkey, every side dish imaginable, and a full spread of pies for dessert. Such feasts, however, carry a steep price tag—I enjoy eating at Boxing Cat Brewery now and then, but there’s no way I’d consume 400RMB worth of Thanksgiving dinner (for comparison’s sake, a regular dinner there runs 150-200RMB, if you order an entree and two beers). It’s certainly possible to buy all the ingredients for a traditional Thanksgiving meal here, but doing so would run up a pretty hefty bill at the half-dozen import grocery stores I’d have to visit to assemble everything. Also, I have neither the equipment nor the facilities to prepare all of my favorite dishes, like sweet potato casserole (hold the marshmallows). So over the years, due to a combination of choice, cheapness, and necessity, I have come to this conclusion: Thanksgiving is about comfort food, whatever that might be. Warm, filling food on a cold, dark night at the end of November. Best shared with others, but that’s not a requirement. I decide what I most want to eat for dinner that night and either make it or go out. On three occasions (2007, 2008, and 2012), my Thanksgiving dinner has consisted of huge bowls of oatmeal topped with sugar and cinnamon. I love oatmeal—to an admittedly strange degree—so if that makes me feel thankful and content with my life, who cares that it’s not a turkey or pumpkin pie? I didn’t have oatmeal for Thanksgiving this year, though. There’s a Korean restaurant right down the street from where I live, and I eat there at least three times a week. 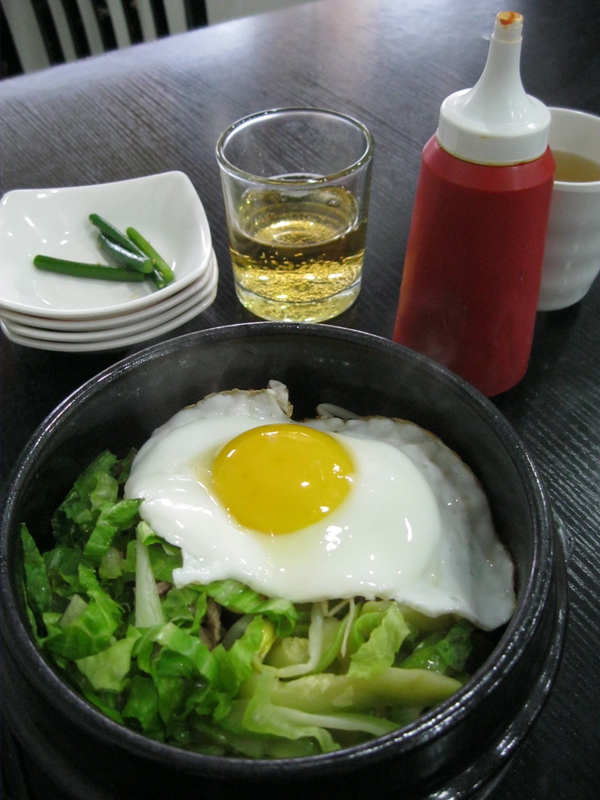 They make excellent bibimbap (rice in a stone bowl, topped with vegetables, some meat, and a sunny-side up egg), and that’s what I ate for Thanksgiving dinner—followed by candied sweet potatoes for dessert, in a nod to the holiday. It was exactly what I wanted. I’ve grown accustomed to being away from my family on Thanksgiving, and while I would be with them if I could, I can deal with improvising my own holiday dinner. But missing Christmas—which I’ve done three times in the past decade—is much harder. I think it’s because while Thanksgiving is just one day, to me Christmas is a whole season, filled with cookie baking, tree decorating, a visit to Longwood Gardens, and the sound of Mario Lanza’s Christmas carols filling my parents’ house. I have a lot to be thankful for this Thanksgiving, as I do every year, but I am especially thankful that I’ll be home for Christmas in just a few weeks. Though I do wish that Philadelphia had more good Korean restaurants, because I am going to suffer some major bibimbap withdrawal when I leave here.